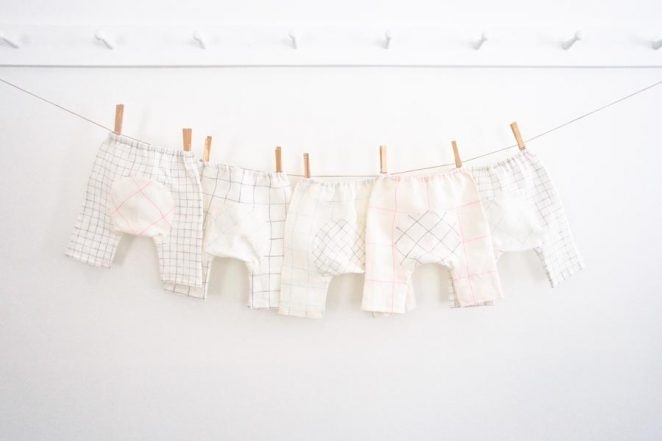 It seems only proper to celebrate the newest member of the Purl Soho family (our beautiful Linen Grid) with my favorite project for new members of my own family: Baby Pants. Linen Grid’s spare beauty and heirloom-quality linen make these Baby Pants perfect for new members of any family! 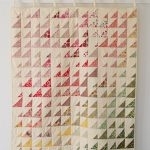 I had such a blast sewing up this pile of Baby Pants, mixing and matching Linen Grid’s different scales and colors. 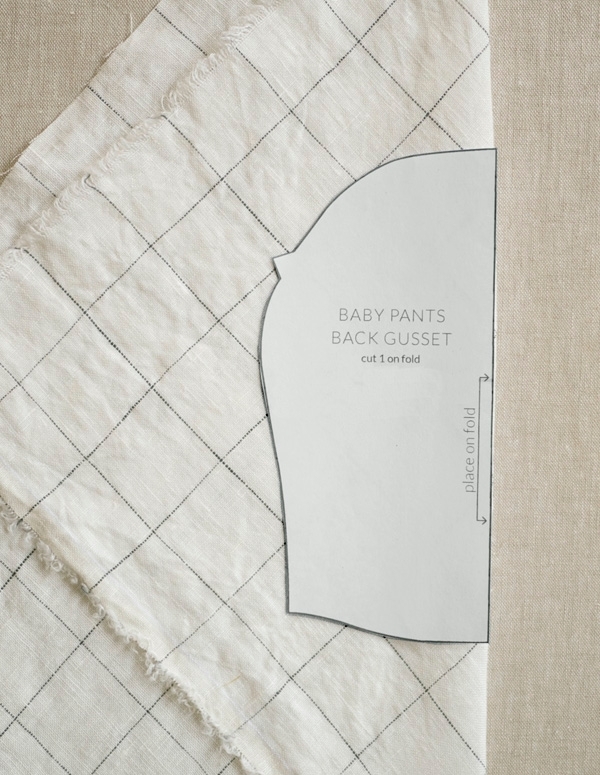 And in a departure from the original pattern, I cut this “diaper gusset” on the bias, making the interplay of fabrics all the more…well, playful! It may be helpful to know that 1 yard of fabric is enough main fabric for 3 pairs of Pants; 1/4 yard is enough for lots of gussets; and 1 yard of elastic is enough for 2 pairs of pants. 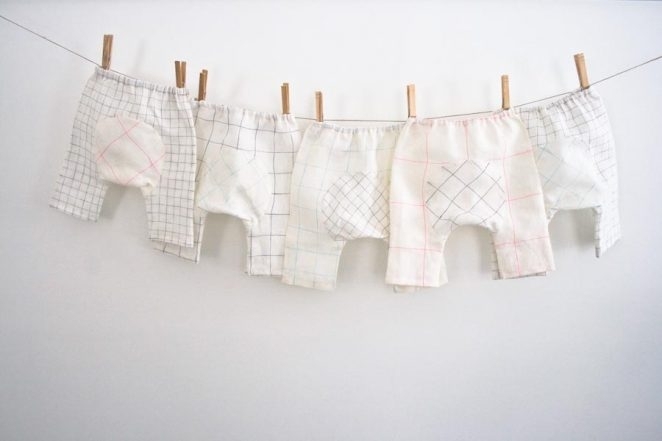 To make the 5 pairs of pants you see here, we used 1/2 yard of the Linen Grid in the colors Glacier Blue/Heirloom White, Dark Graphite/Classic White, and Super Pink/Heirloom White, plus 1 yard in Silver Gray/Classic White. To fit 0-3 months, 3-6 months and 6-9 months. 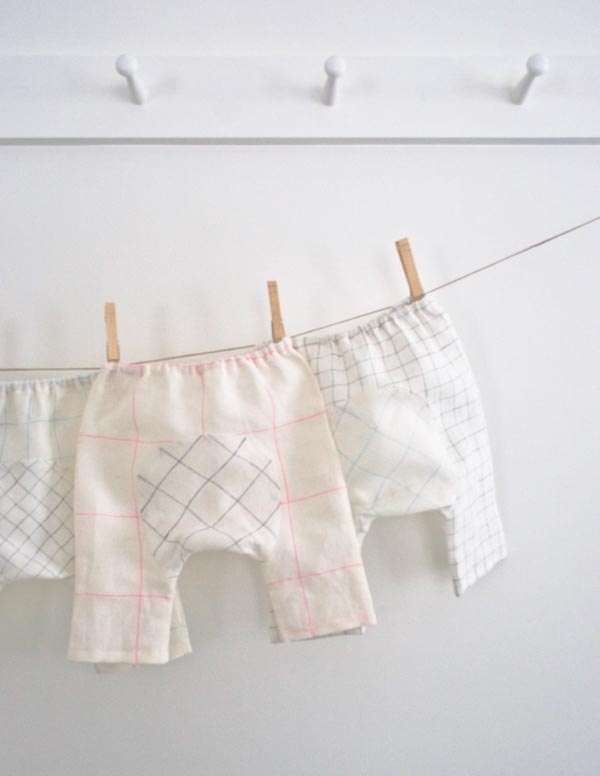 For the full pattern, including step-by-step photos and lots of tips, visit our original Baby Pants post! Before you cut the Gusset piece, fold the fabric on the bias. 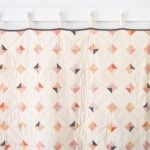 The grid pattern of the fabric makes this easy. The fold should run diagonally through the squares of the grid. Place the template along the folded edge of the fabric and cut around the template. I want the adult version. Please? You’re right! 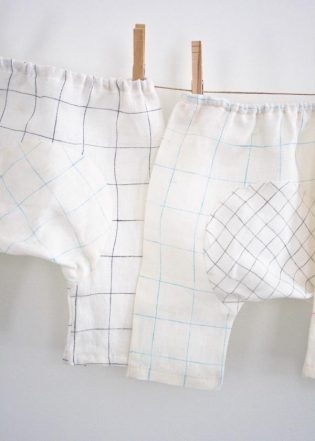 These would be a great summer pant for adults! Unfortunately we do not have this pattern for adults at the moment. However, either our free City Gym Shorts pattern, or the Merchant and Mills 101 Trouser would be lovely (and so comfortable!) 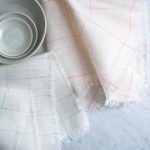 in the new Linen Grid, and are available in a whole range of adult sizes. 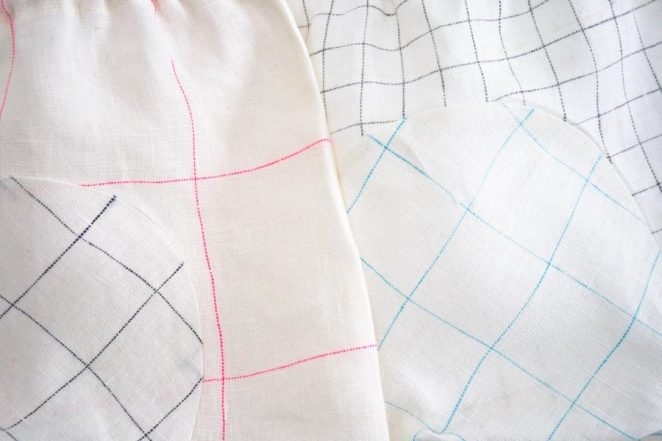 Hi, I am wondering if this pattern is available in larger sizes, or if you would be able to provide the measurements to increase the size to a 1 or a 2 yr. What a great pattern and i have such wonderful Liberty of London fabric from Purl Soho to use! Extend the top edge of the Pants Front pattern piece so that the measurement from the crotch edge to the top edge is equal to the crotch to waist measurement you took above, plus 2 1/4 inches. 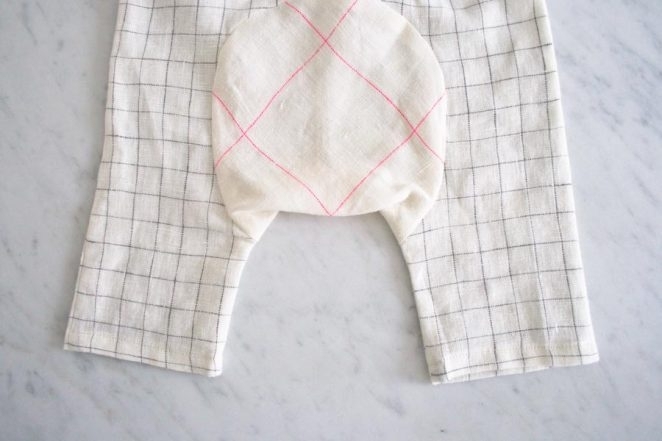 Extend the side edge of the Pants Front so that the measurement from the fold line to the side edge of the pattern piece is equal to 1/4 of the waist measurement plus 1 1/4 – 1 3/4 inch. Extend the leg of the Pants Front so that the measurement from the top to bottom edges is equal to the waist to ankle measurement plus 1 1/2 inch. Now, place the original Pants Front pattern piece on top of the new adjusted pattern piece. Measure the distance between the original edges of the pattern piece and the extended edges. For example, you may find that you added 1 inch to the top edge, 1 inch to the side edge and 1 1/2 inches to the bottom edge. Make these same extensions on the Pants Back pattern piece. Cut the waist elastic to the waist measurement plus 1 inch. Keep the Gusset as is. I hope this helps! Please let me know if you have any questions about these directions. I would love to hear how they turn out! 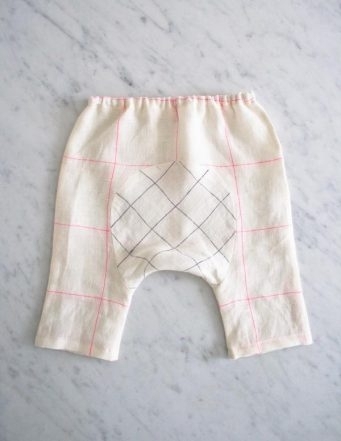 I made these Baby Pants (with some spare material) as a gift for my boss. They were a hit at the work baby shower. Thank you for the adorable free pattern. 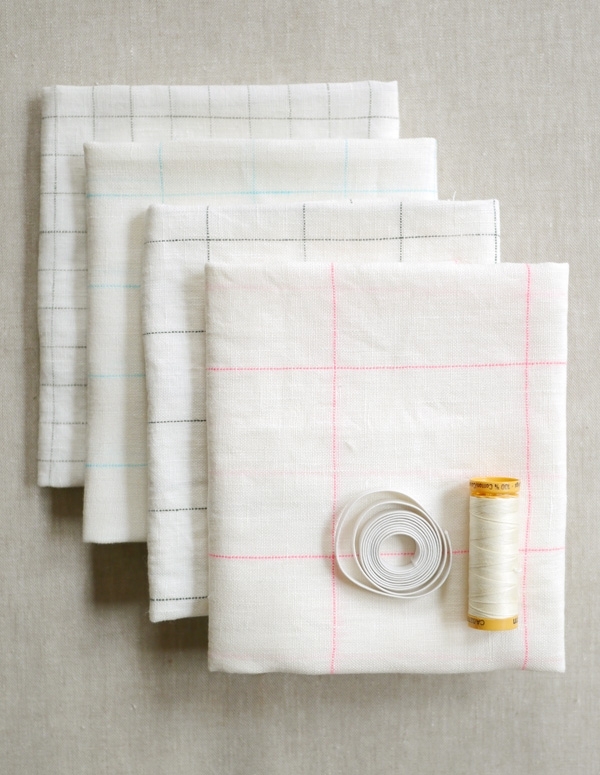 I will be buying some linen grid fabric very soon. Love love love the design. These pants are great! 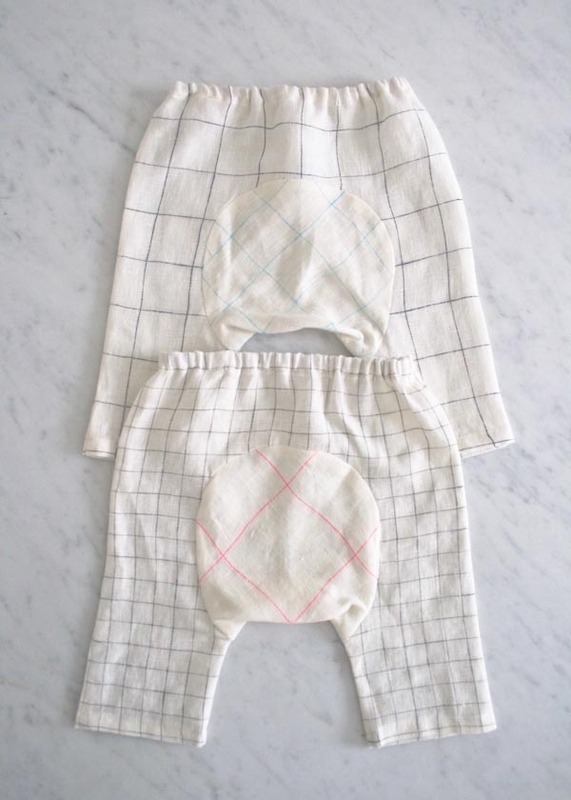 Please please make this pattern for older kids – maybe 12 months and 18 months, and up to 2 years. Thank you for writing in, and for your enthusiastic words about this project! I am so glad you like it! We will definitely keep your suggestion in mind as we plan projects for the rest of the year. Just wondering what fabric to use for babies who live in cold climates. 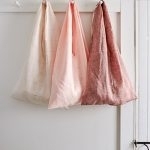 Linen is light-weight. Thanks for the question! I think that flannel would be a great option for babies in colder climates. We have some lovely Mammonth Flannel in plaid and Shetland Flannel in more textured colors. 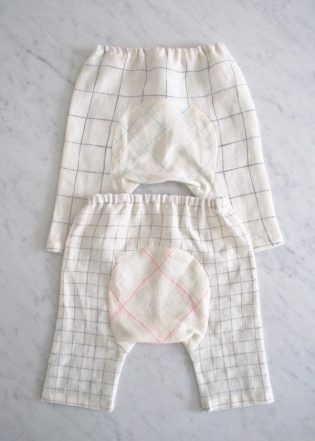 Either one would make adorable and cozy baby pants!